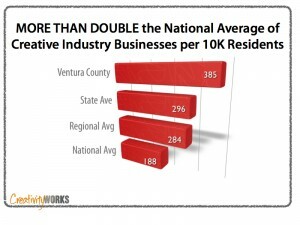 Ventura County boasts more than double the national average of creative business and independent artists per capita. 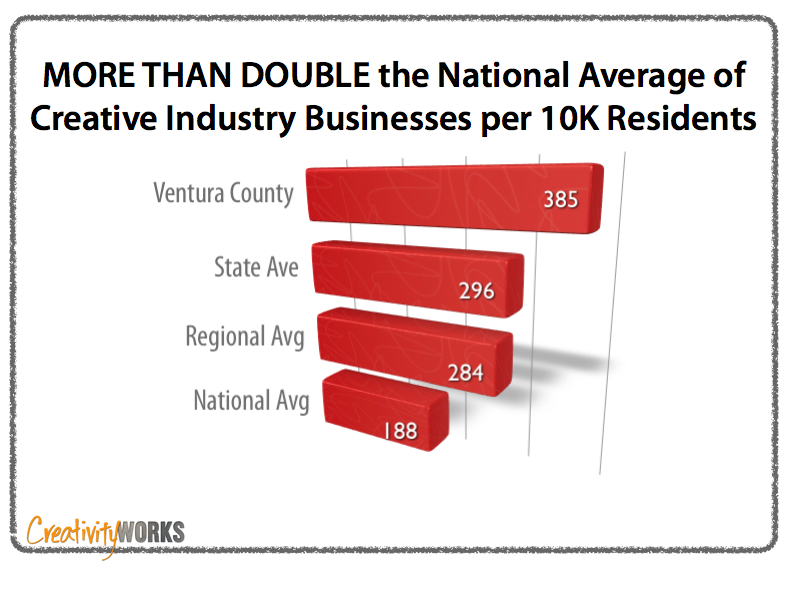 Creative businesses contribute 2.1 billion dollars to the county’s economy- on par with agriculture’s output. Arts non-profits employ over 2,000 workers– similar to county’s 10th largest employer, Community Memorial Hospital. Arts non-profits also engage 7900 volunteer board members and staff, meaning 10,000 Venturans are engaged in cultural organizations. Ventura County’s artists and arts organizations are entrepreneurial and deeply interwoven into the economy, the education and workforce development infrastructure as well as in community development. 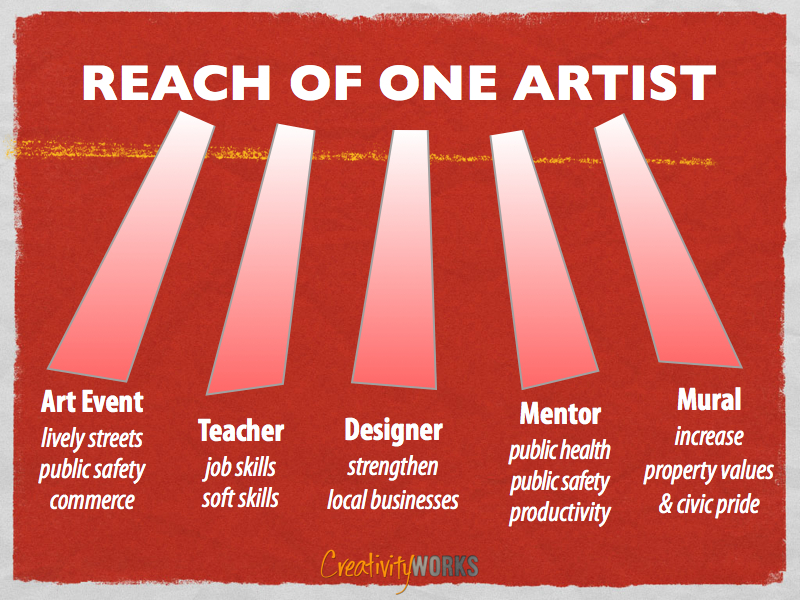 It’s what Ventura County’s creative businesses, artists and arts supporters already do! Vibrancy is a critical component to the success of a place. Research shows that in the new economy, talent is mobile. Instead of people moving to jobs, people now move to the places they want to live, then find work or create businesses there. What people desire are vibrant, diverse places. The Knight Foundation study confirms this. “The Soul of the Community” study conducted by Gallup found that three characteristics of a place consistently drive community attachment: Social Offerings, Openness and Aesthetics, beating out Safety, Economy and even Education. The Economy is strengthened in Ventura County not only by cultural tourism, but by the sheer number of creative businesses (artists, musicians, photography supplies, arts organizations, design firms, animators and media producers to name a few) that sell their goods and services, purchase their supplies and employ their workers here. A creative economy work force lives here too. In Los Angeles, 1 in 7 jobs are in the creative industry. When those workers live here, 80% of their wages circulate in Ventura County’s economy. 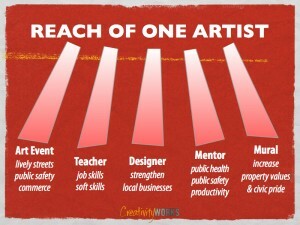 For more information, visit the “Arts Impact Resources” page.